With their compact cockpits, full keels and narrow hulls, the cruising boats of old are like a lone watch-stander, bundled up in foul weather gear, head bowed, arms folded, tucked in under a dodger for shelter. With their compact cockpits, full keels and narrow hulls, the cruising boats of old are like a lone watch-stander, bundled up in foul weather gear, head bowed, arms folded, tucked in under a dodger for shelter. By comparison, the Beneteau Sense 55 is a sunbather stretched out on deck in the tropics, clad in cocoa butter and a Speedo. Not that the boat doesn&apos;t sail well: it just represents a very different design philosophy, one that literally opens itself up to let the sunshine in. The Sense 55’s hull is solid fiberglass, and the deck has a balsa core. The hull-deck joint is screwed and bonded with a polyurethane adhesive sealant, then covered with a solid wood toerail that is bolted in place. The bow is nearly plumb—both in keeping with the latest fashion and to extend waterline length—and a hull chine runs from the transom to a point nearly amidships. In theory, this chine should provide additional form stability and help the boat track when it is on its ear. But it’s the twin rudders that truly define this boat’s performance potential. Broad-sterned boats like the Sense 55 can be a handful in a strong breeze—if the boat heels enough to make the rudder lose its grip in the water, you’ve got problems. But with twin rudders there will always be a blade buried deep in the water, so a designer and builder can provide tremendous amounts of cockpit and stowage space aft without creating a boat that’s hard to control in a stiff breeze. The aluminum double-spreader deck-stepped mast has wire rigging, and there’s a strong point on the foredeck for an inner stay. There is a double anchor roller with an attachment point for an asymmetric reaching sail. The fin keel is all iron. Overall construction quality is solid and well executed, just as you’d expect from such a veteran boatbuilder. Like the Sense 43 and Sense 50 that preceded it, the Sense 55 has zero accommodations aft of the cabintrunk, which means this entire space is given over to the cockpit and a pair of spacious lockers. (If desired, an optional crew berth can be added to the locker on the port side.) The result is a dining/social area that rivals that of a multihull, complete with an ingenious and truly massive articulated drop-down swim platform. The cockpit is so large that Beneteau has included a waist-high stainless steel handrail running fore and aft near the centerline, so you’ll have something to grab onto when moving about in a seaway. To port is a fairly conventional cockpit bench seat, to starboard a wraparound seat and dinette table that wouldn’t look out of place aboard a luxury catamaran. Like many belowdecks saloon tables, this one can be lowered to settee level to create a double berth for those interested in sleeping out under the stars. The mainsheet runs to a fiberglass arch that also serves as an anchor point for a dodger. Our test boat was equipped with a second optional arch over the transom, which can serve as both a davit for a dinghy and a base for antennas, solar panels and a wind generator. Side decks are wide, with good antiskid, and flush hatches eliminate a major cause of stubbed toes, although the deck tang for the inner stay may trip up the unwary. Other nice touches include beefy stainless steel grabrails on the steering pedestals and on either side of the mainsail arch and an absolutely enormous foredeck locker. The one downside to the Sense 55 is that, like a catamaran, it lacks nooks and crannies for wedging yourself in when the weather decides to turn ugly. This is not a complaint, more an observation of one of the consequences of choosing a boat that has clearly been designed with a particular sailing style in mind. 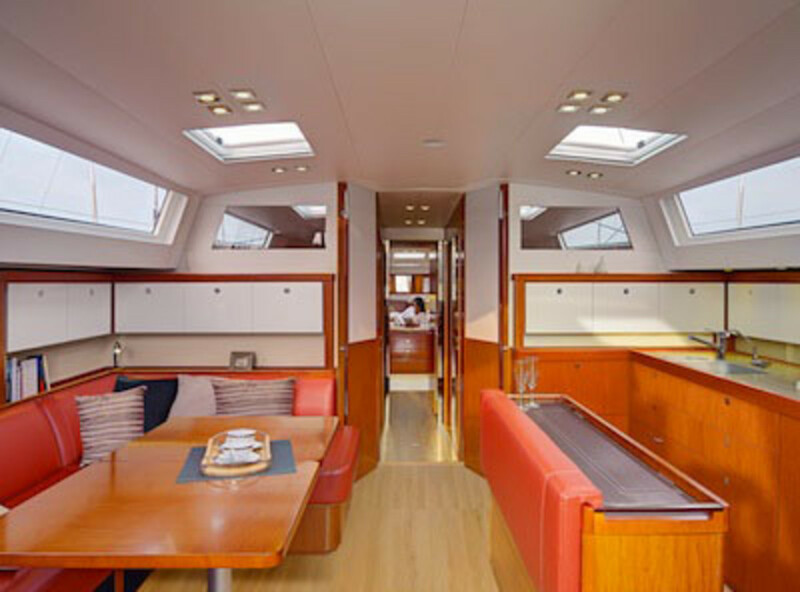 In the Sense tradition, the distinction between the cockpit and belowdecks spaces has been minimized, much as it is aboard a cruising multihull. Just three easy steps take you down to a massive saloon suffused with light from a plethora of overhead hatches and ports in both the hull and cabintrunk. There is a spacious in-line galley to port and a massive settee to starboard. In a very nice touch, the portside settee doubles as the seat for a large, well-appointed nav station. 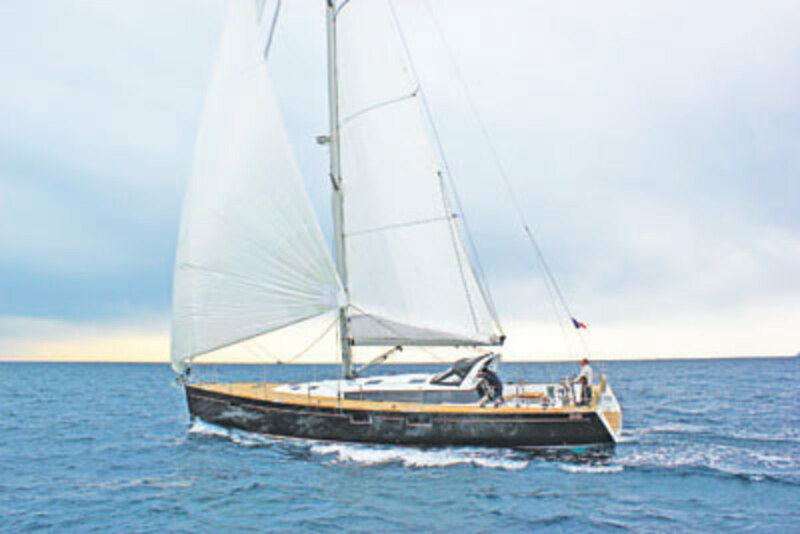 While the overall feel is similar to that of a multihull, the arrangement is actually more like that aboard many powerboats, with a centerline passageway between twin amidships cabins leading to an owner&apos;s cabin in the bow. There is a wealth of space and amenities, including a small desk, dual hanging lockers, and a separate shower and head in the owner’s stateroom. We had a beautiful evening for a sunset sail off Miami Beach, just the kind of sailing the boat is made for. There were seven of us on board with plenty of room to spare. The boat did well as we put it through its paces in a dying breeze and came about without hesitation. The boat did feel a bit sticky in the light conditions, a natural consequence of the extra wetted surface area that comes from the extra rudder and the beam being carried well aft. But in one brief 16-knot gust, it gave us a taste of what it’s capable of—digging in its shoulder, lifting some of that wetted surface out of the water and coming to life as it accelerated to 7 knots. Ultimately, I suspect this is a boat with two distinct gears: a light-air slow-speed setting that provides a stable platform for entertaining and relaxing; and a high-speed setting when there’s enough wind to induce some heel and get the boat flying. Not surprisingly, with its twin rudders and 75hp diesel the Sense 55 did everything we asked of it heading to and from the Miamarina at Bayside. Throttling up to 2,000 rpm gave us 4.8 knots of boatspeed, while 2,500 rpm moved us along at 6 knots, and 3,000 rpm pushed us along at 7 knots. Beneteau’s proprietary Dock & Go joystick maneuvering system is an option and makes sense in a boat this size—especially in the Med or any place else where squeezing into tight marinas and stern-to docking will be a regular part of the experience. 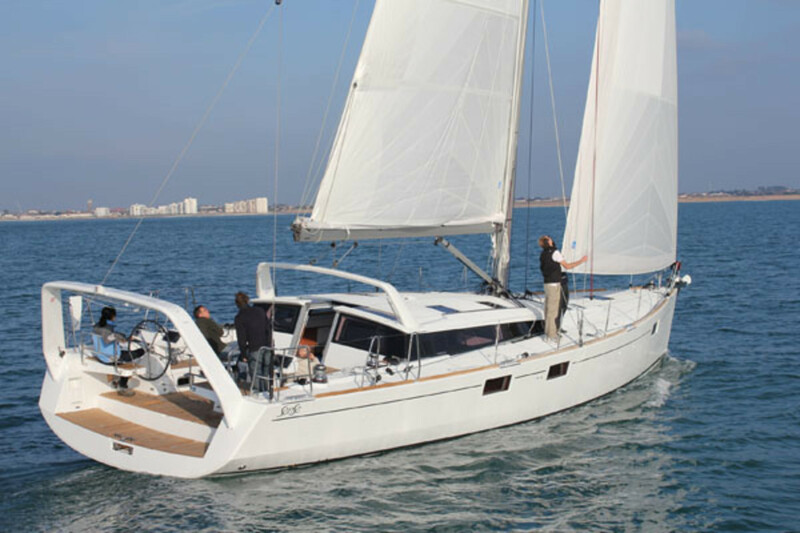 If your idea of a good time afloat is battling a Force 6 headwind in the North Sea, then the Beneteau Sense 55 might not be the boat for you. But if you’re looking for a combination of performance and comfort afloat, this boat has a lot to offer.